If you scored 14% on a test, most people would consider that a failure. I see it as showing room for improvement. I recently tried to determine my ‘ancestor score’ and it turned out to be 14%. An ancestor score is the percentage of ancestors in 10 generations that I have identified. Last Saturday, Randy Seaver of the Genea-Musings blog asked his readers to determine their ancestor score so I played along. In 10 generations, a person will have 1,022 direct ancestors. This starts with your parents and walks through grandparents, great grandparents, etc. Once you add yourself, you have 1,023 people. I had no problem counting the people in my family tree through the 6th generation, but after that, it becomes difficult to count everyone. 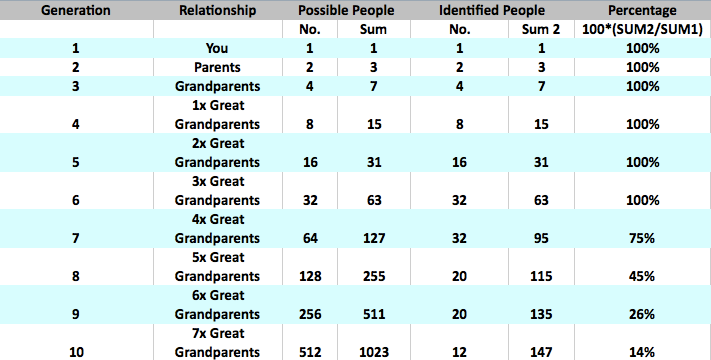 After all, a person has 64 4x great grandparents. To ease the burden, I created what is called an Ahnentafel Report. An Ahnentafel Report can be created in most genealogy software programs and places all of the direct ancestors of a particular person (in this case me) in numeric order. It becomes very easy to determine how many ancestors of each generation you have. You can see my results below. Overall, I don’t consider my score to be horrendous as I have 100% of my ancestors identified through 6 generations and 75% identified through 7 generations. For most people, the 7th generation leads back to the early 1800’s. So I don’t consider this to be a poor score; it just means that I have much more research to do!